The musical files on this page are temporarily disabled. Between 1996 and 1999, three musical groups were formed to perform within the Portugal Porto Mission. Each group toured cities of the mission, performing in the chapels of the Church. The music was very well received by the members. Performances by the groups often filled the chapels to overflowing. We found the Portuguese people loved music, especially music of the Gospel. The first musical group was called the Banda Louvando. They produced a cassette album called Cantando Louvamos. The group consisted of Claudio Aguiar, Reed Bell, Ryan Bell, Steven Gridley, Jeremy Griggs and Corbin Jones. The album was recorded live at the Coimbra chapel by Paulo Moreira. Cantando Louvamos. This selection has a long leader, so be patient. If you were using a Java-enabled browser, you would see the clipstream player instead of this paragraph. To learn how to enable your browser for Java audio, please visit this page. A Medley of Hymns. This selection also has a long leader. If you were using a Java-enabled browser, you would see the clipstream player instead of this paragraph. To learn how to enable your browser for Java audio, please visit this page. The second group to perform was organized in 1997. The album they recorded was call Ha Um Salvador. The group consisted of Sonia de Jesus, Rosalynde Frandsen, Kim Checketts, Nicole West, Jeff Christensen, and Greeg Adams. From the first musical group we learned the importance of recording the music in a studio. Consequently, the later recordings are better. Meu Pai Celeste Me Ama performed by Jeff Christensen, Greg Adams, Kim Checketts, Sonio de Jesus, Rosalynde Frandsen, and Nicole West. If you were using a Java-enabled browser, you would see the clipstream player instead of this paragraph. To learn how to enable your browser for Java audio, please visit this page. Ha Um Salvador. Soloists: Jeff Christensen and Rosalynde Frandsen. Chorus: Greg Adams, Sonio de Jesus, and Nicole West. Pianist: Kim Checketts. If you were using a Java-enabled browser, you would see the clipstream player instead of this paragraph. To learn how to enable your browser for Java audio, please visit this page. 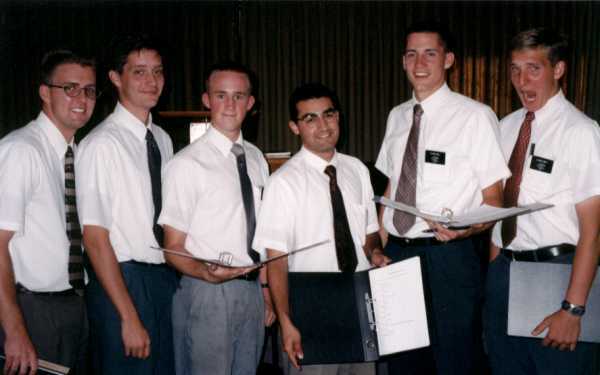 The third group was organized in 1998. Their album is called Creio Em Cristo. This group changed between the time they performed and when the album was recorded. The performing group consisted of Elders Alton, Webb, Patterson, Johnson, and Menzie and Sisters Francom, Jensen, Pack, and Graham. 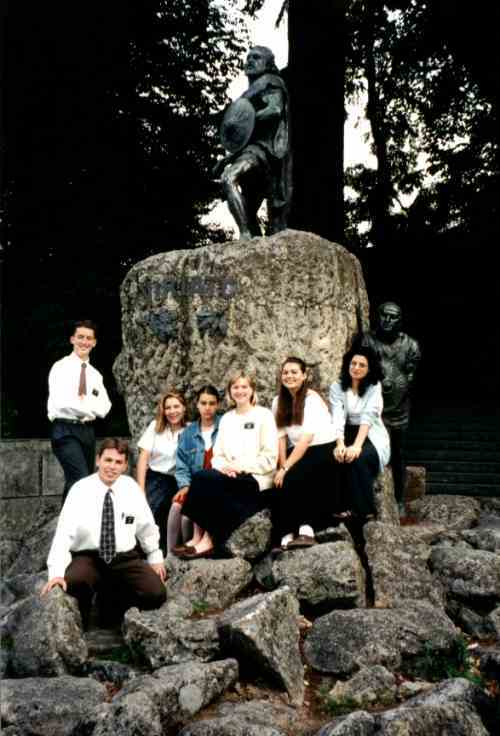 The recorded group consisted of Elders Patterson, Johnson, Webb, and Grant and Sisters Pack, Jensen, and Francom. Creio Em Cristo, Reading by Elder Menzie. If you were using a Java-enabled browser, you would see the clipstream player instead of this paragraph. To learn how to enable your browser for Java audio, please visit this page. A Portuguesa, The National Anthem of Portugal. If you were using a Java-enabled browser, you would see the clipstream player instead of this paragraph. To learn how to enable your browser for Java audio, please visit this page.